Well, it’s been a while since my last entry and I apologize for taking so long. It has been quite busy here at the Kranich’s Jewelers Corporate office. We have lots of new features currently in development which will be revealed in store and online projected Fall 2011. For now, I thought I would share some photos that came across my desk from one of our popular designers Scott Kay and their new design, the Dream Collection. For any questions you may have about Scott Kay Jewelry or for more on any specific piece offered at Kranich’s Jewelers, visit Kranichs.com or call 888.944.4575 and we will be happy to help you. This entry was posted in Scott Kay and tagged Scott Kay on July 29, 2011 by admin. As you may or may not know, one of the biggest annual jewelry events of the year took place just a few days ago. JCK Las Vegas opened its doors at their new home at Madalay Bay in Las Vegas, Nevada on June 3rd and lasted through the weekend until the 6th. All of your favorite designers found at Kranich’s Jewelers were in attendance including Simon G. Jewelry, Verragio, Scott Kay and many more. New offerings were also available from the Forevermark Diamond Collection coming soon to all Kranich’s locations. Every year JCK Las Vegas remains a premier event unveiling the latest in fashion and bridal jewelry for the upcoming season. Look for new selections from all of your favorite designers coming to kranichs.com in the following weeks. For questions about the new styles arriving or for more on any specific piece offered at Kranich’s Jewelers, visit Kranichs.com or call 888.944.4575 and we will be happy to help you. This entry was posted in Belle Etoile, Diamonds, Fashion Trends, Ritani, Scott Kay, Simon G., Verragio and tagged Belle Etoile, diamond jewelry, fashion jewelry, jck, jewelry show, Ritani, Scott Kay, Simon G., Verragio on June 13, 2011 by admin. In my regular searches for all of our favorite designers today, I finally came across the YouTube channel of Scott Kay. Here is a little sample of what I found from the newest addition to our designer jewelry collections here at Kranich’s Jewelers. For more about Scott Kay, SK Cobalt or about any other specific piece offered at Kranich’s Jewelers, visit Kranichs.com or call 888.944.4575 and we will be happy to help you. This entry was posted in Scott Kay and tagged Designer Jewelry, designer mens rings, kranichs designer, Scott Kay, SK Cobalt on November 3, 2010 by admin. NEW YORK, Sept. 10 /PRNewswire/ — Men’s fine fashion jewelry has broken new ground. The former dormant category has awoken to dramatic consumer demand and is now billed as a true fashion accessory by jewelry artisan Scott Kay and Couture, the premiere fine jewelry industry event, through New York Fashion Week. From September 9th to the 16th, 2010, Scott Kay will be the exclusive men’s jewelry on display by Couture inside the tents of New York Fashion Week at its new home of Lincoln Center. In the midst of one of the most difficult economic times the jewelry industry has ever endured, Scott Kay (credited as America’s best sold luxury, designer bridal brand and a pioneer in men’s fashion jewelry) will help guide the jewelry industry to newfound heights. Scott Kay will be the exclusive men’s jewelry proudly featured in the bold new Accessories Presentation built into the main rotunda of the New York Fashion Week tents of Lincoln Center…the must-pass bustling entrance to the runway presentations of Mercedes Benz Fashion Week, an event produced by IMG. Consumers agree. In every market Scott Kay introduces the “Art of Man” collection, his hand-carved and crafted designs sell out and the demand continues to increase. Examples of this success are within every Saks Fifth Avenue major market, including three dominant displays in New York City‘s Saks, hundreds of men’s specialty shops and independent fine jewelry stores worldwide. “Scott Kay is not a bridal company. We are not a fashion company. We are a lifestyle brand. The Couture display inside the tents of Mercedes Benz Fashion Week is the perfect modern vehicle to celebrate that fact,” added Dan Scott, CMO, Scott Kay, Inc. September’s Vogue, Gioiello also offers a cover story on the success of Scott Kay, a perfectly timed editorial for this milestone event. This entry was posted in Scott Kay and tagged Designer Jewelry, designer mens rings, kranichs designer, Scott Kay, SK Cobalt on September 11, 2010 by admin. Yes, it has been quite some time since we have written a post. That is due to the addition of a brand new designer line to the Kranich’s Jewelers family. Over the past four weeks visitors to Kranichs.com may have noticed we now carry designer Scott Kay Designer Jewelry along with SK Cobalt bands. We are all very excited to welcome the new designer to our site and into our four stores. 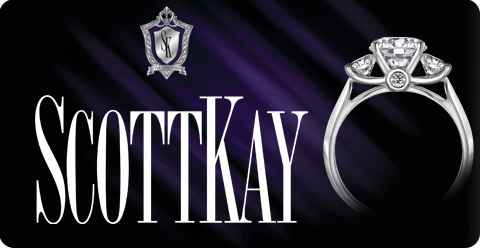 Scott Kay offers a full line of engagement ring mountings and wedding rings to create the perfect wedding set. Scott Kay engagement rings feature the Contemporary Collection and the Vintage Collection, sometimes featuring the Crown Setting. We also continue adding men’s bands from all of Scott Kay’s collections including the Sparta Collection and the BC Collection. So please stop by Kranichs.com and see the new designs for yourself, or better yet, stop by one of our locations to see it in person. A wonderful selection for him or her, Scott Kay designer jewelry has arrived at Kranich’s Jewelers. This entry was posted in Scott Kay and tagged Designer Jewelry, designer mens rings, kranichs designer, Scott Kay, SK Cobalt on September 9, 2010 by admin.